Simply stated, this is one of the finest teas we have ever tested. The first infusion offers an exquisite sweetness that is difficult to match. The second infusion with slightly different characteristics will taste as good, if not better. Brewing instructions are not printed on Consumer (Bulk) packages. Please see the How To Brew page for brewing instructions. 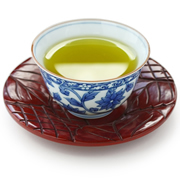 Excellent Shincha brews exactly like Sencha, except that you should get good results from a water infusion temperature of 70°C (160°F).